With the release of my Ebook: The Phoenix, I’ve had a lot of questions on social media regarding the Chin-Up. As it is a move which is a staple in most of my programming due to the upper back strength benefits and the role that plays in athleticism. It’s probably no surprise this brilliant bodyweight movement is included within The Phoenix. One of the questions I’m asked a lot is: “How do I build up my Chin-Up if I can’t do one yet?”. This article will address that. Every good coach has their set-processes to improve their athlete(s). Progressions and movements they have tweaked and refined over the years to elicit the fastest results in the particular attribute that needs improved. Whether it’s speed, core, fitness or upper strength. Here, I will share my process for taking athletes from 0 chins to repping them out with weight! I’ve used the below method time and time again with success upon success. 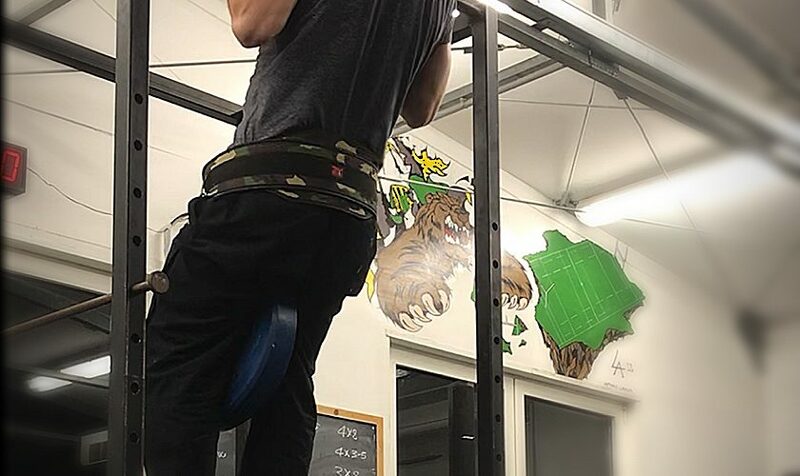 In fact, I used it for myself to increase my 1RM on Chin-Up strength to set a gym record (see video) with modified accessories to match my strength level. Side note, in this post, to set a starting point, I will make the assumption that you can dead-hang on a bar for 10s without losing your grip. With that being said, let’s proceed. 1. Include the Chin-Up in your routine 3 times per week. 2. Don’t do a ‘back day’ unless you plan to follow rule 1 as well (see above)! 3. You MUST take full rest (2-4mins for most) between sets. 4. You are training true strength here – see above! 5. When doing your eccentrics, you must go all the way to the dead-hand position; otherwise you will struggle later. 7. DO NOT climb up to perform an eccentric and then JUMP your feet off. Instead, climb up, slowly take your weight in your hands, removing one foot (and one toe if needs be) at a time until you are supporting all your bodyweight through your hands and can start a strict eccentric WITHOUT SWINGING. 8. The below can be included in whole body training sessions, or upper sessions. 9. Treat the reps as ‘clusters’ and take up to 10-20s between each rep with up to 4mins between sets (though you can superset with a pressing option). 10. Lastly, when you can complete 3 x 10s eccentric on the Chin-Up movement (using the guidelines above and the protocol below) you will be able to do 1 or more complete Chin-Ups. I’ve used this process with over 100 athletes and clients, and by the time they hit 3 x 10s eccentrics, they are always able to hit a Chin-Up. Congratulations! You’ve just joined the long list of people who worked through this process and are now champions of the Chin-Up. Enjoy your new found upper back strength! And if you want to know where to go from here, get in touch.